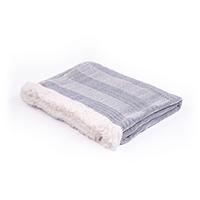 Sunbrella throw blankets deliver remarkable craft and comfort. 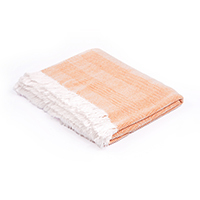 Enjoy quality, endurance, and plush softness in every handwoven throw. Made from Sunbrella acrylic, the decorative throw blankets feature a soil, stain, and water-resistant coating. Suited for the outdoors, the material is fade repellent and easy to clean (even with bleach). Every throw is 44 x 72 inches with a 2-inch sewn fringe. The warm, lightweight blankets are a sleek accessory piece. Use the throw blankets for couches, patio furniture, indoor furniture, boats, commercial décor, and more. In color schemes inspired from nature, they're available in high-depth patterns and solids. Pair with Sunbrella upholstery fabrics, drapery, pillows, and marine fabrics for smart design opportunities. Try Sunbrella Indoor/Outdoor Throws in Melon/Natural Chevron for a warm tone. Sustainably made in the USA.